Come and see how Freedom Leisure’s fitness and wellbeing facilities can help you prepare! We know if we work with you, you can achieve your summer goals, so act now - try our health and fitness facilities FREE OF CHARGE 3 times in April*. 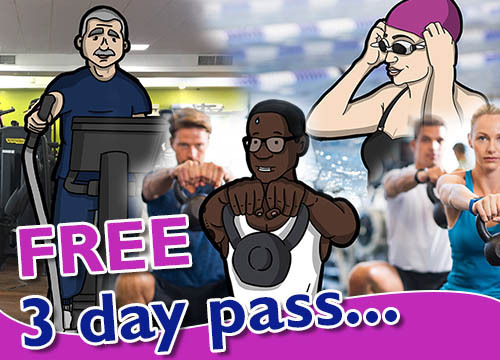 Whether you are kicking off your fitness regime, trying out something new or getting back into your favourite class, swim session or gym routine – with a FREE 3-day guest pass to your local Freedom Leisure centre, it couldn’t be easier! So simply complete the form below, grab your trainers and get active for the summer. Remember, we are with you every step of the way. Terms & Conditions: Your three day pass is valid for use on seven consecutive days and will expire after the seventh day. One pass will be issued per person. The three day pass is only available for those aged 18 & over. The three day pass cannot be shared and is non-transferable and with no advance booking rights. All three day passes will expire on 30/04/19 with a last issue date of 29/04/19. All facilities, activities and centres are subject to availability and opening hours. Certain activities and sessions may be excluded. Please speak to your local centre for any other local terms & conditions.